Author(s): Alberto Izzotti, Chiara Ceccaroli, Maria G. Longobardi, Rosanna T. Micale, Alessandra Pulliero, Sebastiano La Maestra, Sergio C. Sacca. Department of Health Sciences, University of Genoa, Via A. Pastore 1, 16132 Genoa, Italy. Glaucoma targets a variety of different tissues located in both anterior (e.g., trabecular meshwork) and posterior (e.g., optic nerve head) ocular segments. The transmission of damage between these structures cannot be simply ascribed to intraocular pressure increase. Recent experimental findings provide evidence for the involvement of molecular mediators including proteins and microRNAs. Aqueous humor protein composition is characteristically altered during glaucoma progression. Immunohistochemistry analyses indicate that proteins characterizing glaucomatous aqueous humor are released by damaged trabecular meshwork. This feature incudes (a) Nestin, involved in stem cell recruitment and glial cell activation; (b) A Kinase anchor protein, released as consequence of mitochondrial damage and Rho activation establishing cell shape and motility; (c) Actin related protein 2/3 complex, involved in actin polymerization and cell shape maintenance. 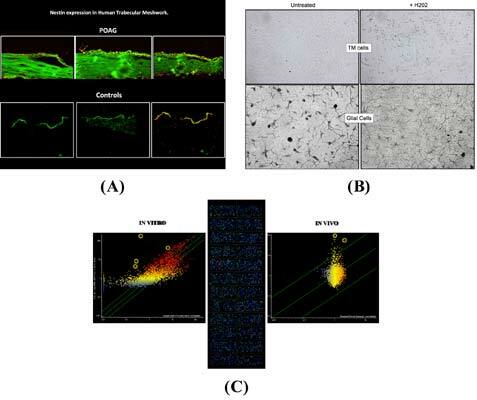 As established both in vitro and in glaucomatous aqueous humor, trabecular meshwork cells damaged by oxidative stress release extracellular microRNAs inducing glial cell activation, an established pathogenic mechanism in neurodegenerative diseases. Released microRNAs include miR-21 (apoptosis), miR-450 (cell aging, maintenance of contractile tone), miR-107 (Nestin expression, apoptosis), miR-149 (endothelia and extracellular matrix homeostasis). Experimental evidences indicate that the uveoscleral pathway, via suprachoroidal space, can provide a potential route of access from the anterior region to the posterior segment of the eye and could represent the path followed by biologic mediators to reach the inner layer of the peripapillary retina and transmit damage signals from the anterior to posterior segment during glaucoma course. Keywords: A kinase anchor protein 2, actin related protein 2/3 complex, aqueous humor proteins, IOP increase, microRNA, Nestin, ONH damage, primary open angle glaucoma. Keywords:A kinase anchor protein 2, actin related protein 2/3 complex, aqueous humor proteins, IOP increase, microRNA, Nestin, ONH damage, primary open angle glaucoma. Abstract:Glaucoma targets a variety of different tissues located in both anterior (e.g., trabecular meshwork) and posterior (e.g., optic nerve head) ocular segments. The transmission of damage between these structures cannot be simply ascribed to intraocular pressure increase. Recent experimental findings provide evidence for the involvement of molecular mediators including proteins and microRNAs. Aqueous humor protein composition is characteristically altered during glaucoma progression. Immunohistochemistry analyses indicate that proteins characterizing glaucomatous aqueous humor are released by damaged trabecular meshwork. This feature incudes (a) Nestin, involved in stem cell recruitment and glial cell activation; (b) A Kinase anchor protein, released as consequence of mitochondrial damage and Rho activation establishing cell shape and motility; (c) Actin related protein 2/3 complex, involved in actin polymerization and cell shape maintenance. As established both in vitro and in glaucomatous aqueous humor, trabecular meshwork cells damaged by oxidative stress release extracellular microRNAs inducing glial cell activation, an established pathogenic mechanism in neurodegenerative diseases. Released microRNAs include miR-21 (apoptosis), miR-450 (cell aging, maintenance of contractile tone), miR-107 (Nestin expression, apoptosis), miR-149 (endothelia and extracellular matrix homeostasis). Experimental evidences indicate that the uveoscleral pathway, via suprachoroidal space, can provide a potential route of access from the anterior region to the posterior segment of the eye and could represent the path followed by biologic mediators to reach the inner layer of the peripapillary retina and transmit damage signals from the anterior to posterior segment during glaucoma course.